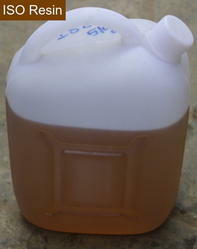 Pioneers in the industry, we offer iso resin from India. ISO Resin provides higher strength & protection compared to General Purpose Resin. Our company is highly acclaimed in offering a wide range of Fiberglass Resins like General Puporse Resin (GP Resin), GP resin for UV rays, GP Superior Resin, ISO Rein, etc. These are used in different industries for fire safety in the mass transport, aerospace, automotive, and oil field industries. Our resins are suitable for a variety of processing techniques, such as hand/wet layup, SMC/BMC, RTM, pultrusion, filament winding, prepreg and autoclave.